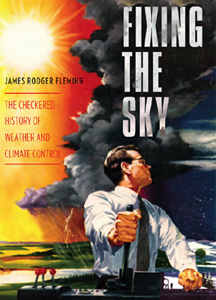 The weather has been manipulated using airplanes since the 1940's, as recounted in James Fleming's book, "Fixing The Sky: The Checkered History of Weather and Climate Control." Fleming is also interviewed in the documentary film Why In The World Are They Spraying? May 18, 2018-- Geoengineering the atmosphere has been touted by climate scientists as a means to reduce global warming and mitigate its various impacts. They point to dangerous methane releases in the Arctic, melting glaciers, ocean acidification and extreme weather to justify using big jets to spray reactive chemicals into the sky. However, Antarctica's ice cap is growing, and the phenomenon of global warming has itself been challenged by those alleging ulterior motives lay behind it. Regardless, a handful of the country's top universities, including Harvard, Stanford and Carnegie Mellon, along with The Royal Society in the U.K., are leading lights in what appears at first glance to be a noble undertaking. 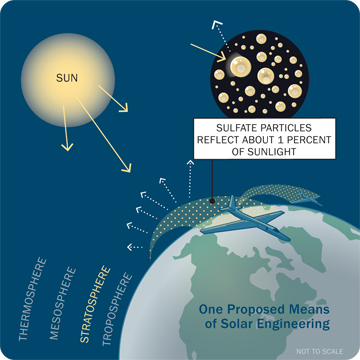 By dispersing reflective particles into the atmosphere, and doing it daily for the forseeable future, global temperatures will cool as sunlight gets bounced back into space. But where does such an audacious scheme come from? In a 2008 paper published by The Royal Society, a research team explains, "The concept of ‘geoengineering’ has been considered at least as far back as the 1830s with J. P. Espy's suggestion of lighting huge fires that would stimulate convective updrafts and change rain intensity and frequency of occurrence." A century and a half later, at the “22nd International Seminar on Planetary Emergencies”, a scientific paper from H-Bomb inventor Dr. Edward Teller introduced the aerial spraying program fueling so much controversy today. Held in Siciliy in 1997, the seminar brought together experts from around the world to discuss solutions to the prospect of a dangerous climate shift that might decimate the human species. According to Dr. Teller's paper, it was possible to create a manmade sunscreen around the planet, cooling it down just like ash clouds from a massive volcanic eruption would. In particular, "Materials such as Al [aluminum] ..., which auto-coat with durable, oxygen-impervious, high-integrity oxide-skins of only a few monolayers thickness, might be aptly employed...The corresponding scattering systems may be... stratospherically dispersed from an airplane tank as a suitably fine aerosol, the individual nanoparticles of which would quick-freeze at stratospheric temperatures..."
In the 2001 book Death in the Air: Globalism, Terrorism & Toxic Warfare, free-lance journalist William Thomas elaborated on how this proposed spray job might be implemented. With the Cold War over, the U.S. Air Force had 700 refueling tankers available for immediate re-assignment. The planes could be easily modified to carry vaporized metals in place of jet fuel. This depiction of a chemtrail operation indicates that sulfates are dispersed from the aircraft. However, physicist Edward Teller called for the use of aluminum, as do patents associated with the technology and even Harvard's own Professor David Keith. Graphic: Harvardmagazine.com. Following the logic behind Dr. Teller's plan, nearly all forms of air pollution help cool the planet because the haze they create blocks the sun. Moreover, his proposal amounted to an epic departure from the conventional wisdom prevailing just five years earlier. At that time, climate scientists agreed that only by cutting CO2 emissions, conserving energy, and restoring ocean and forest habitats could the perils of global warming be averted. Under this proposal, alternative energy sources would be fast-tracked to replace greenhouse-gas emitting power plants. In addition, the phytoplankton and trees that already convert most of the world's carbon dioxide back to oxygen would be better protected through legislation and treaties. Destroying The Planet In Order To Save It? A sharp rise in aerosol pollution, causing the worrisome phenomenon of global dimming. Less sunlight hinders the growth of crops, reduces solar panel electricity and promotes drought. the prospect of catastrophic ozone layer depletion. As far back as 1992, the National Academy of Sciences had considered the aircraft spraying strategy and recommended against its deployment. The ozone layer is earth's only shield against ultraviolet violet light from the sun, and its loss imperils nearly all biological life forms, from plants to humans. the massive deforestation taking place throughout Asia. Geoengineers concede that a perennial drought in Asia and Africa is an inevitable side effect of aerosol spraying. the unprecedented tree die-off in California. Geoengineers don't list this as a consequence of weather modification, but chemtrail opponents remain skeptical about the other causes cited to date. an ever declining food supply for the world's population. The reduction has been linked to global dimming and extreme weather events. continued temperature increases on the ground. Aerosol obscuration prevents the earth's absorbed heat from rising back into the atmosphere. Such rising heat is critical to generating rainfall in the tropics, without which the rainforests will collapse. Such developments seem to contradict the stated goal of geoengineering and aerosol spraying, which is to slow down global warming and its consequences, not speed things up. This may be why scientists at Carnegie Mellon, Stanford and Harvard are playing coy when it comes to their unusual job occupation. When they're not making the rounds at science conferences, enjoying lunch with billionaire investors, or taping interviews at Comedy Central, geoengineers like David Keith and Stanford's Ken Caldeira insist that dispersing aluminum into the sky is just an idea they're batting around their heads. It's not something that's actually taking place in realtime. That would require congressional hearings, legislation, environmental assessments, etc., etc. An occasional field experiment may be conducted here and there, dispersing "minimal amounts of compounds" and "under strict university controls", but that's all there is to see right now. In 2009, Keith also started a private company. Based in Canada, Carbon Engineering hopes to market equipment one day that will remove carbon dioxide from the air and turn it into a synthetic, non-fossil fuel. Besides being in its infancy, this attempt to reduce CO2 emissions one gas tankful at a time is a far cry from the programs Prof. Keith has written about for two decades. Until recently, he had defined geoengineering as "the intentional large-scale manipulation of the global environment" with "the primary intention of reducing undesired climatic change caused by human influences." Such statements carry the brazen ring of Edward Teller, who was himself known to wax giddy in extolling the power of nukes. "We will change the earth's surface to suit us," he once said. All of which makes you wonder. Is there a darker side to Teller's aerial spraying campaign? Actor Peter Sellers (top photo) played the title character in Stanley Kulbrick's 1964 movie, Dr. Strangelove - or How I Learned to Stop Worrying and Love the Bomb . 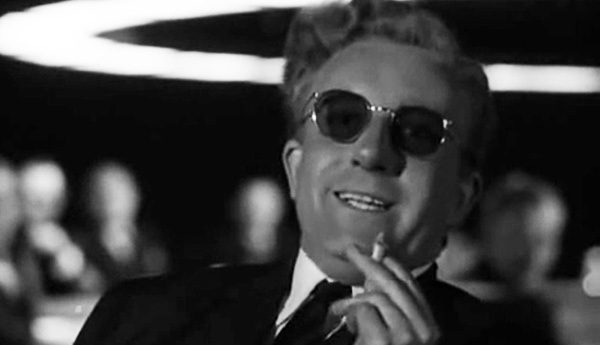 Edward Teller is rumored to have been the inspiration for Strangelove. 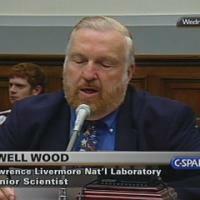 As for authoring a study on aerosol spraying, the father of the hydrogen bomb was 89-years-old in 1997 and likely deferred the grunt work to his two co-authors, phycisists Lowell Wood (bottom left)and Roderick Hyde. Both men worked on the Strategic Defense Initiative at Lawrence Livermore Labs, which likely laid the groundwork for many of today's geoengineering initiatives. 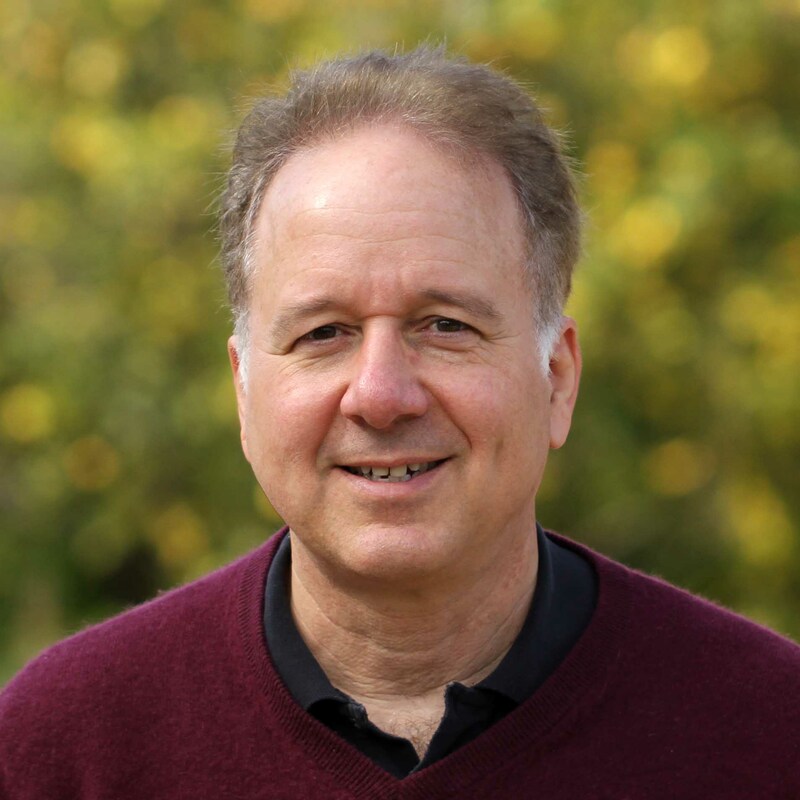 Prof. Ken Caldeira (bottom middle) also called Lawrence Livermore home for 12 years, co-authoring a paper with Dr. Teller for the "24th International Seminar on Planetary Emergencies.” Since Teller's death in 2003, Wood and Caldeira have carried the torch for the aerial spraying initiative, with help from Harvard's Prof. David Keith (bottom right). 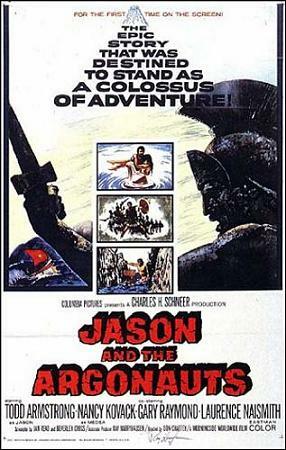 Photos: Columbia Pictures, Twitter, Carbon Engineering. Other critics go further in bashing the chemtrail operation. They suspect the case for global warming made since the 1970's is little more than a bedtime story masking a more nefarious agenda afoot. After all, it’s easier to secure the acquiescence of public officials (and pilots) if you portray your worldwide planet-dusting strategy as an attempt to rescue humanity from explosive methane gas releases and other fallout from a biosphere approaching its boiling point. In a 2014 article posted on the website of Geoengineering Watch, activist Dane Wigington asserts, "Though groups of scientists like the Arctic Methane Emergency Group are calling for 'emergency wartime scale geoengineering to avert planetary catastrophe', available data indicates that the very geoengineering programs they are selling as a cure are more likely a major causal factor in triggering the methane catastrophe in the first place." Although media coverage of geoengineering has focused on the academic players, it may indeed be the case that the R&D phase is over and implementation has begun. In fact, the U.S. Armed Forces have been in the business of modifying the weather since 1947. That year, in collaboration with General Electric, Project Cirrus spawned two natural disasters. The first was the Cape Sable Hurricane in Miami, while a second hurricane made landfall on Tybee Island after a pilot dropped dry ice into it. Although the initiative proved an embarrassment to everyone involved, its stated intention was to prevent disasters, not instigate them, just as it's still claimed today. In the 1960's, a project called Nile Blue investigated ways to steer hurricanes and spawn tornadoes in order to “destabilize weather in the Soviet Union, China and Cuba, thereby ruining food harvests. 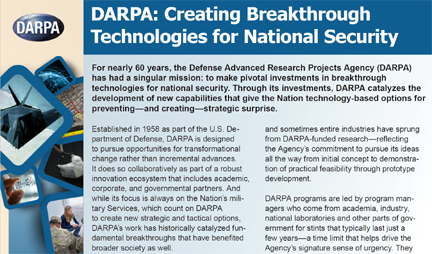 The project made use of the world's largest computer at the time, ILLIAC IV, and was managed by the U.S. Military's Defense Advanced Research Projects Agency, or DARPA. "The key to geophysical warfare is the identification of the environmental instabilities to which the addition of a small amount of energy would release vastly greater amounts of energy... To trigger this instability, the required energy might be introduced violently by explosions or gently by small bits of material able to induce rapid changes by acting as catalysts or nucleating agents." As for how weather modification might be deployed as a weapon, MacDonald explained: "A nation possessing superior technology in environmental manipulation could damage an adversary without revealing its intent. Modification of storms, too, could have major strategic implications. As I have mentioned, preliminary experiments have been carried out on the seeding of hurricanes. The dynamics of hurricanes and the mechanism by which energy is transferred from the ocean into the atmosphere supporting the hurricane are poorly understood. Yet various schemes for both dissipation and steering can be imagined. Although hurricanes originate in tropical regions, they can travel into temperate latitudes, as the residents of New England know only too well. A controlled hurricane could be used as a weapon to terrorize opponents over substantial parts of the populated world." From a legal perspective, the United States is a party to the Convention on the Prohibition of Military or Any Other Hostile Use of Environmental Modification Techniques, or ENMOD. While the treaty explicitly bans weather warfare between nations, it exempts all domestic activities. It's an odd caveat, if you think about it, since weather systems don't normally recognize national boundaries and can end up in any far-flung corner of the earth once they gather enough steam. At any rate, ever since HAARP and its sister facilities went online, the Pentagon has been accused of doing to U.S. cities and towns what it did in Vietnam. While the original design of today's weather (and climate) modification program may be attributed to DARPA and Edward Teller's Lawrence Livermore Labs, the actual programming of today's weather is managed by the U.S. Air Force, Raytheon and other defense contractors. Naturally, when official denials and discrediting of whistleblowers fail to keep the program below the radar (so to speak), the media focus can be easily directed toward those friendly professors at Harvard, Stanford and Carnegie Mellon. Such highly regarded and familia institutions no doubt provide a more palatable storefront than a bunker full of generals. And although it's still of matter of speculation, one might also deduce from the facts on file that control of the weather epitomizes Eisenhower's 1960 warning about a military-industrial complex run amuck. For instance, weather warfare opponents allege on YouTube and their websites that jets may now be dispatched over the Gulf of Mexico at any time to create a Category 5 Frankenstein. And the planes need not even be piloted, as the technology for remotely flying aircraft has long been even commercially available to passenger airlines. Once on location, aerosols can be injected in conjuction with a radio frequency (RF) wave-pulsing scheme to resonate the clouds around a defined eye. In this manner, an otherwise disorganized weather system will coalesce together and gain steam, forming a hurricane. Hurricanes Katrina and Sandy, as well as the more recent Hurricanes Harvey and Irma are offered as examples of geoengineered storms. While hard evidence of these claims may be impossible to obtain without help from a whistleblower, the same activists point to a long list of patents, along with a 1996 military research paper called Owning the Weather in 2025: Weather as a Force Multiplier to make their case. In addition to aerosol spraying (or injection) into cloud banks, the briefing paper lists a host of other weather modification techniques that might be employed to win a war. Of course, there's no war going on in the Gulf of Mexico, while targetting civilian populations is a crime under international law and the U.S. Military Code of Conduct. "As economic competition among many advanced nations heightens, it may be to a country’s advantage to ensure a peaceful natural environment for itself and a disturbed environment for its competitors. Operations producing such conditions might be carried out covertly, since nature’s great irregularity permits storms, floods, droughts, earthquakes and tidal waves to be viewed as unusual but not unexpected. Such a ‘secret war’ need never be declared or even known by the affected populations. It could go on for years with only the security forces involved being aware of it. The years of drought and storm would be attributed to unkindly nature and only after a nation were thoroughly drained would an armed take-over be attempted." Defense contractors working with the U.S. Air Force and NOAA on weather modification schemes. Traders and investment firms active in the futures, weather derivatives, and agricultural commodities markets. Multi-national agribusinesses - especially Monsanto - who are trying to dominate the world's food markets and eliminate non-GMO seeds. For more on the films, see What Are They Spraying In The Sky? The stock market angle represents a particular ugly twist in the chemtrail story. Apparently, whenever drought, flooding and other weather-related calamities occur, hundreds of millions of dollars can be made by hedging with weather derivatives. According to Michael Agne, a trader on the Chicago Mercantile Exchange, “You're betting there's going to be a weather disaster within a particular time-frame, at a particular location, and when it does happen there's going to be a big pay-off.” That’s because disasters impact the volatility index and drive up the price of commodities, utilities, transportation and other service industries. Agne, who's interviewed in the documentary film Why in The World Are They Spraying?, says says that the energy firm Enron traded the first weather derivative at approximately the same time that chemtrailing began. Theoretically, any investor (or corporation) who knows in advance about a coming weather disaster might profit even more by either buying or selling commodities, futures and other stock market products that will be affected by the catastrophe. Indeed, many chemtrail opponents now accuse the world's wealthy elites of having cooked up the global warming scenario in the first place as a novel way to multiply their fortunes. And working at their behest, government agencies like the U.S. Air Force and N.A.T.O., are busy engineering the weather yearround to deliver those disasters on a negotiated schedule. Unfortunately, at the other end of these stock transactions are non-GMO farmers who lose their crops to extreme weather, fungal infections or a variety of other abiotic stresses. According to an ex-farmer and current radio commentator, Barbara Peterson, thousands of small family farms have filed for bankruptcy in recent years or sold out as a result of repeated losses due to bad weather. Peterson, who's also interviewed in Why in The World Are They Spraying?, says Monsanto’s solution to the farmers’ plight – to buy the company’s all-weather and aluminum oxide resistant seed lines – represents another smoking gun behind chemtrails. 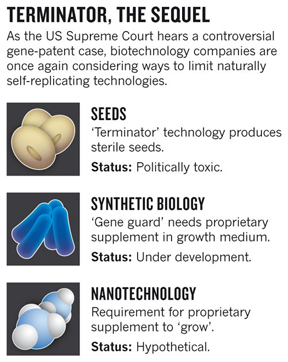 Approved by the USDA in 2001, Terminator seeds produce sterile seeds in crops, forcing farmers to buy a new batch each season. Because of the current controversy surrounding them, Peterson says the seeds are still not widely used, so Monsanto relies on its patents and a 40-page contract to prevent farmers from using the non-sterile seeds they collect during harvests. While the cost of GMO seeds is formidable, the plants that sprout are capable of surviving the full gamut of abiotic stresses – drought, flooding, frost, excess UV radiation and even aluminum oxide poisoning. Such seeds may also provide a shorter growing season, thus affording the chance for a second planting if the farmer's first crop fails. Preying on the misery of the farmers, investment groups have gobbled up the acreage when it’s eventually put up for sale or auctioned. Among the buyers, Peterson notes, is billionaire hedge fund manager George Soros. And his isn’t the only firm cashing in, according to Bloomberg.com. While the eulogy for organic and non-GMO seeds is no doubt being written as we speak, the reverberations of agribusinesses taking over almost all American farms don't end there. In fact, one might lie awake deep into the night pondering various genetic modifications that Monsanto and its rivals (if there are any left) have in store for our dinner table. Unlike vaccinations, parents can't simply say no when it comes to feeding their children. Neither can they relocate outside this country's borders to escape the genetically mutated harvest. The Wall Street farm grab is a global phenomenon. In 2011, for example, Soros bought Adecoagro, which operates more than three dozen massive farms in Brazil, Argentina and Uruguay. Moreover, the world's richest man, Bill Gates, has himself become a Monsanto investor in recent years. 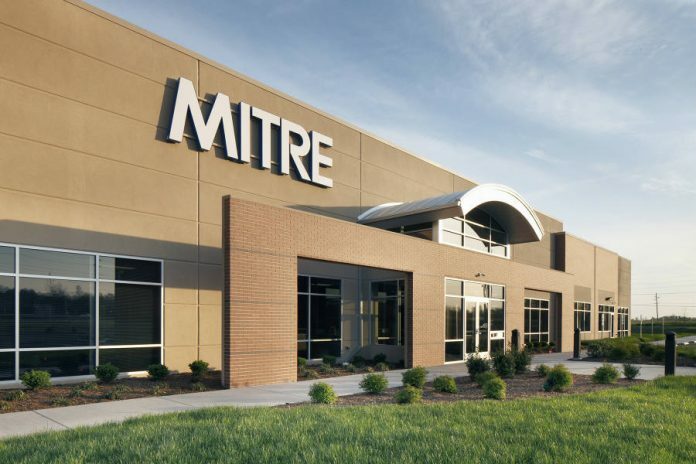 Significantly, the company is actively marketing its GMO seed products in Africa, where the Microsoft founder operates a charitable foundation. So far, however, the nonprofit Alliance for a Green Revolution has promised not to use GMO seeds. 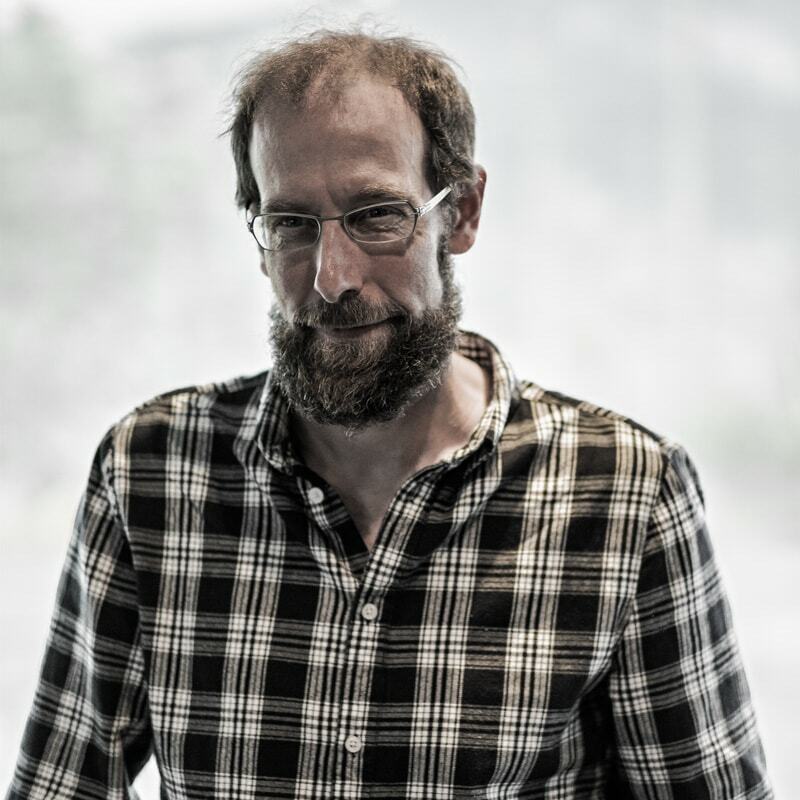 Gates is also connected to geoengineer David Keith, who has managed Gates's Fund for Innovative Energy and Climate Research. For more on GMO's and developments in agriculture, please see the documentary film The World According to Monsanto. So what happens when a forecast of clear skies is always followed by hazy days with artificial cloud cover? Or what if a weather-modified tornado strikes after evening news programs predict only a slight chance of showers? We may never know, since the weather forecasting industry has itself undergone modification in the last several years. As in the case of farmland, financial firms have suddenly developed a yen for this business, assuming control of television and online outlets throughout the Unites States and beyond. In 2011, the Rothschild banking family bought a majority stake in Weather Central, the Wisconsin-based distributor of interactive weather services. The purchase no doubt piqued the interest of conspiracy theorists, as the Rothschilds figure prominently in Jim Marrs’ 1995 book Rule By Secrecy. Within a year, the U.K. based Weather Service International, or WSI, acquired Weather Central. WSI is itself a subsidiary, owned by an Orwellian sounding entity called The Weather Company, or TWC. And we've all heard of TWC’s most famous division, The Weather Channel. In recent years, TWC has also acquired the online services Weather Underground and Intellicast. And who owns TWC? That would be Comcast’s NBC Universal, the Blackstone Group and Bain Capital. Of this curious trio, the latter two firms were prosecuted and fined by the SEC in 2014 for collusion in buying up companies to reduce competition. The name Blackstone Group might also prick the ears of conspiracy theorists, having been co-founded by a long-time Rockefeller Family associate, Peter Peterson. Peterson chaired both the Council on Foreign Relations and the New York Federal Reserve at the time of the September 11th terrorist attacks. (His firm enjoyed a "strategic alliance" with Henry Kissinger Associates as well.) It's alleged that Blackstone Group may have participated in the so-called inside job that brought down the Twin Towers on that fateful day, and that the collapse of 7 World Trade Center late that afternoon was a planned demolition. Returning to more recent events, in October 2015, IBM bought TWC -- that is, except for The Weather Channel, which minus its digital arm remains the property of Blackstone Group, et. al. And that purchase was preceded by Google's announcement of a new partnership with The Weather Company to provide online storm tracking. It’s expected that any independent weather forecast services still operating will soon fall by the wayside now that the mother of all search engines is throwing in with Big Brother. One reason for the shroud of secrecy may involve the company that provides NWS employees with most of their data. 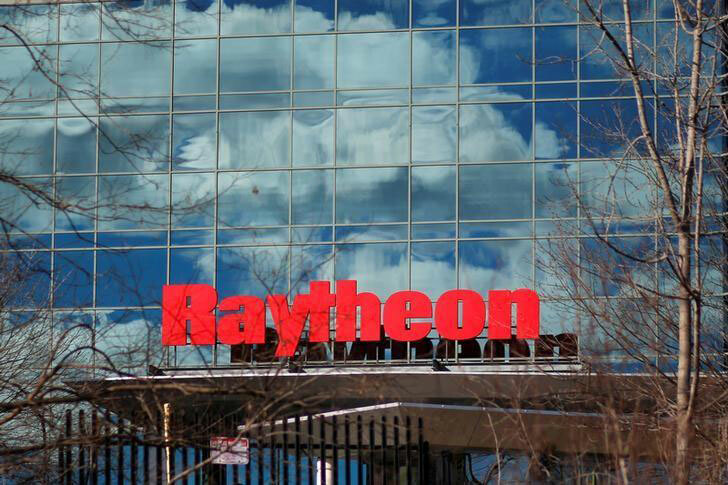 Raytheon is one of the nation's top defense contractors, providing missile systems, intelligence and surveillance capabilites, drones and cyber-security for the U.S. Air Force and other divisions of the military. In 2015, it received over $2 billion dollars in mission support contracts alone. Raytheon also manages the much touted Advanced Weather Interactive Processing System (AWIPS) through a subsidiary called E-Systems. AWIPS gathers satellite, radar and hydrological data worldwide for downloading into weather modeling programs at NWS and NOAA stations. Interestingly, E-Systems owns the Bernard Eastland patent mentioned earlier in this article. It's a lot to digest, isn't it? Given so much circumstantial evidence of dire events on the horizon, you might be wondering what top U.S. environmental organizations have to say about geoengineering and weather modification. Turns out, neither the Sierra Club nor the Natural Resources Defense Council have flinched, which is troubling given that both groups are headquartered in fire-ravaged, forest-collapsing California. The NRDC, whose leading P.R. man is Robert Redford, has so far offered a lukewarm shoutout to the geoengineering teams at Stanford, Harvard and Carnegie Mellon. For its part, the Environmental Defense Fund says it supports what it describes to its donors as small-scale, outdoor weather modification field experiments. And therein lies the crux of this 21st century pickle we find ourselves in.